Krivoklat castle is one not yet fully discovered by the tourists, yet it is one of the most beautiful and authentic in the Czech Republic. Many films have been made here due to it's ideal, medieval look. After you are met by your professional guide, you will be driven to the castle, about 1 hours drive from Prague. It is located in a very green, hilly area on the river Berounka, east of Prague. There you join a tour through the castle in the language of your choice, visiting the interior as well as the outside. After the visit of about 1 houryou are driven back to Prague. 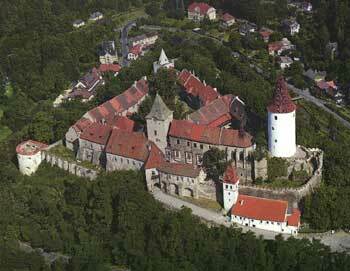 History: The castle of Krivoklat belongs to the oldest and most important castles of the Czech princes and kings. The history of its construction starts in the 12th century. During the reign of Přemysl Otakar II. a large, monumental royal castle was built to be later rebuilt by king Václav IV. and even later generously enlarged by king Vladislav of Jagellon. The castle of Křivoklát was seriously damaged by fire several times. It became a feared prison and its importance sank rapidly. First during the Romantic époque of the 19th century (when under rule of the family of Fürstenberg that owned the castle until 1929) the castle was reconstructed - and saved. See a beautiful castle chapel, the Great Royal and Chivalric Halls with an exhibition of Gothic paintings and sculptures, the castle library containing over 52.000 bands, a rich museum and a painting gallery of the Fürstenberg, a famous castle prison with torture chambers and torture instruments, a monumental tower with a collection of hunting trophies and a view of the surrounding area, a pleasant walk around the castle walls, the tower Huderka with an open-hearth kitchen and an observatory gallery, the seat of the captain with temporary exhibitions…all of this and much more belongs to Křivoklát, a national cultural monument. The castle is open daily from April to October, except Mondays. Closed in the winter. Not suitable for people with serious walking difficulties.